Belly Dance Lessons Online And Are They For You? Ballet Steps for Kids – Beginners Especially! Coordination in Dance and How We Can Improve on It? Fixing Bad Posture – Why Is Posture And Alignment So Important? 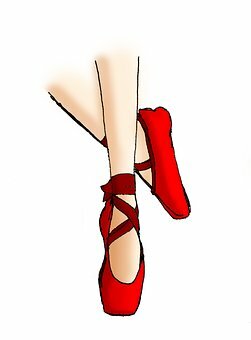 Red ballet shoes are very popular and I am not sure if it has any correlation to the story of The Red Shoes, but let’s look at what types of red ballet shoes you can purchase online. The Red Shoes Movie is a 1948 British drama film written, directed, and produced by Michael Powell and Emeric Pressburger. The film is about a ballerina who joins an established ballet company and becomes the lead dancer in a new ballet called The Red Shoes, itself based on the fairy tale ‘The Red Shoes’ by Hans Christian Andersen below. The movie if you are interested can be purchased online for about $4 by clicking on the picture below. The Red Shoes Movie stars Moira Shearer (famous ballerina of her time), Anton Walbrook and Marius Goring, as well as other well-known dancers at the time. The film won best original score and best art direction at the 21st Academy Awards. It also got nominations for best picture, best original screenplay, and best film editing. In 1999 it was voted the 9th greatest British film of all time. In 2017 it was voted 5th best British film ever. The story of The Red Shoes is the only reason that I can think of why so many people want to own a pair of these ballet shoes. Here are some options for anyone looking to purchase red ballet shoes. These can be purchased online at discounted prices. Simply Click on the picture or link that interests you to find out more. Same size as sport shoes Size 12C and Size 12.5C suitable for children. Toe Pad 1 is pink color, Toe Pad White is white color, just different colors; Soft ballet shoes with pure high-quality ribbon, High quality and economic dance shoes for ladies. Noted: Please choose the size as your usual wear, for example, you wear US size 8 sports shoes, you can choose the size 8 dance shoes. Package included: 1 pair ballet shoes, 1 pair toe pads, 1ps shoe bag. These satin ballet slippers have a high-quality leather sole with a soft and smooth satin upper. They are non-slip and durable as well as comfortable and breathable, as well as cost effective. Perfect for ballet, jazz, gymnastics, yoga, modern dance, and even as a costume. Canvas upper and leather sole. High-quality canvas top with a split leather sole and elastic drawstrings. 8 colors to choose from. These ballet shoes are canvas and come in both red and pink. These shoes are imported leather and with a suede sole. Durable and long-lasting PU leather with elastic straps. Elegant embroidered design and split soles for ease of movement. The color of the shoe is guaranteed not to fade. These comfortable red pumps are synthetic with elastic in the back of the shoe to keep them firmly on your feet. They can be rolled up and put in your bag. They come with an adorable matching hair bow. These gorgeous boots can be worn as ballet shoes or just as something comfortable to lounge around the house in. For more information on buying shoes online, click here. Who Exactly Is Olga Preobrazhenska?